There are not too many of the mini screen prints left, and it may be awhile before we have the time to make more. The Spusta Gnomes are busy mixing a wide variety of the remaining mini prints into Mystery Trio Mini Print Packs that will be offered in the Shop today and next Wednesday. 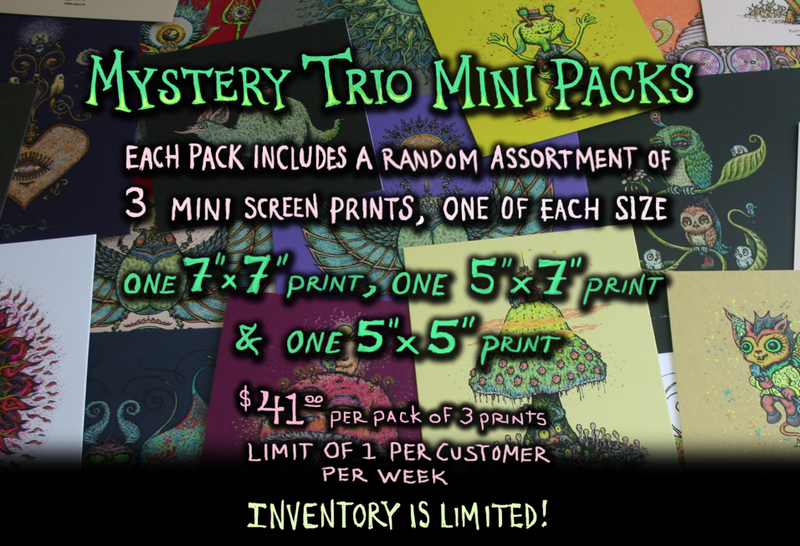 These Trio Packs will include one of each of the 3 common sized mini screen prints, a 7″ x 7″, a 5″ x 7″ and a 5″ x 5″. The packs will be a limit of 1 per customer, per week. Each pack will be a completely random assortment of colors and designs. The 2 larger prints are signed. There are also a handful of hand colored or embellished minis mixed in these packs, so be on the lookout. Today’s drop, on May 28th, let’s do it at around 3 PM PST. Sound good? Probably not for all of you, so maybe we will squeeze a little extra inventory out late tonight as well. Sweet! Get your refresh fingers ready!! heck yeah I should be home just in time for this one!! Late night rocks !got a pretty good kidney plus minis for a hand embellished thinkin on it! Love the idea of a mixed pack, And oh, the things I’d do for an embellished Wax Walter or Seven Birds! lets get ready to rumbleeeeeeeeeeee. Let the good tubes roll ! ran to get that darn Muffy Milk n tuna! Missed it! Thanks for staggering the drop!!! 😉 I still got a shot! Yes! Can we get a picture of the embellished Seven Birds? Saw that on Facebook but am not a member. I bet it’s ( . Y . )’s. The Seven Birds I mean. Not Facebook. Same drop time as last week??? Just seeing what time the thread is set at. Thanks for doing an earlier drop…..normally I am at work. Got myself a mini pack today thanks very much. Now I should go get ready for my 5.30 am start.